Observed on stems of a Solanaceae, Solanum incanum, at Eldoret, Kenya, January 2012. Bitter Apple Nightshade, the host plant for this specimen of tree hopper, has many sharp thorns. 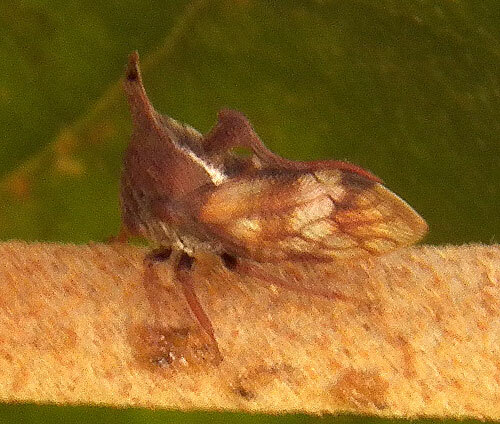 Thus a tree hopper disguised as a plant thorn could well hide from birds looking for an insect meal. On the other hand, this bug has two very sharp points and might well become a thorn in the predator's mouth! Tree hoppers of many shapes and species inhabit plants in Kenya and elsewhere. They subsist by sucking sap from the plant stems and are very often accompanied by ants. The ants gather honeydew from the bugs abdomens and protect them from various threats.